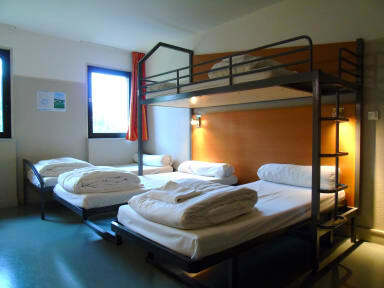 Welcome to CIS de Champagne, an ‘éthic étapes’ institution and Reims’ number one youth hostel. We are located just a ten-minute walk from the town centre, cultural attractions and sports centres. Just across the street is the main park in Reims, Parc Léo Lagrange. The train station is a 15-minute walk away and the tram stop is just 200m from the main entrance. Free parking spaces are available in the neighbouring streets and in the nearby stadium car park. Our hostel has 200 beds in rooms ranging in size from one bed to five. We have rooms equipped with a private shower and toilet; other rooms have a private shower and communal toilets (in the corridor). We also have three rooms designed for guests with reduced mobility. The hostel was renovated in 2009 and presents a friendly atmosphere to its guests. Free wifi is available throughout the centre and all guests have access to a small communal kitchen (utensils provided), ideal not just for cooking your own meals but also a great way of meeting other travellers. The reception desk is staffed 24/7 by our bilingual reception team so there is always someone to answer any questions you may have. Groups of more than ten people are invited to contact CIS directly so that we can best respond to your needs. In order to support sustainable tourism, CIS carries out a wide range of practices on a daily basis: we conserve water, use organic products, reduce energy consumption and separate waste, to name just a few examples. Our constant aim is to share our love for environmentally-friendly practice with our guests.